DigiFreq is a participant in the Amazon Services LLC Associates Program, an affiliate advertising program designed to provide a means for sites to earn advertising fees by advertising and linking to amazon.com. Modartt releases ANT. PETROF 275 concert grand piano for Pianoteq. This physically modelled virtual instrument is authorized by PETROF and is available as an instrument pack for Pianoteq 6. PETROF 275 Concert Grand Piano is the PETROF company flagship, bringing the authority required for concert halls. It maintains the colourful, romantic and rounded tone which the PETROF instruments are praised for, thanks to first class materials. The instrument reflects the skills, care and innovatory spirit inherited ever since Antonín Petrof built his first grand piano in 1864. The new pianos of premium brand ANT. PETROF were designed by the PETROF R&D Department, using an anechoic chamber for its acoustic measurements. The ANT. PETROF 275 concert grand piano includes several patented innovations, such as the newly designed solid maple bridges. The result is an exceptional bass and treble response, greater soundboard resonance, and a pure, singing tone. Moreover, its European solid spruce soundboard delivers PETROF’s characteristic romantic tone with a wide dynamic range. This physically modelled virtual instrument for Pianoteq 6 is authorized by PETROF, spol. s r.o. 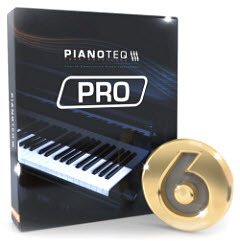 and captures the characteristic PETROF sound with a range of presets offering a beautiful palette of timbres suitable for all kinds of music. ANT. PETROF 275 concert grand piano is available as an instrument pack (€49/$59) for evaluation in the latest update 6.3 of Pianoteq and in the free trial version. More details with audio samples on the website www.pianoteq.com.